One of Australia’s best kept secrets, fresh Australian sweet persimmons* are a delicious, crisp and crunchy fruit that is just pure pleasure and are in season from late February to early June. Persimmons are visually stunning and full of natural sweetness; one of those rare gifts of nature that will tantalise your senses. Originally from China, this oriental beauty has a glossy skin that ranges from pale orange to a deep red-orange depending on the time of the season and the variety. They also have a dainty green flower-shaped cap known as a calyx. This pretty exterior hides a surprising delight, a unique star pattern in the flesh of the fruit, only visible if cut horizontally. Persimmons ripen at the same time as their tree erupts into its glorious autumn display of reds, oranges and yellows. Late harvested fruit is often still on the tree when it is devoid of leaves, making the bare tree look like it has been decorated with shiny orange baubles. The natural sweetness of persimmons pairs well with both sweet and savoury dishes, as well as a range of nibbles and finger foods. When you’re entertaining, impress your guests by adding sliced persimmons to a cheese platter with a wedge of aged cheddar and your favourite variety of blue cheese as well as some shaved prosciutto and crackers or crusty bread. Or for a family meal that is pure pleasure, toss with beef, coriander, basil, shallots and chilli in a wok and add a delicious garlic and lime dressing for a persimmon Thai beef salad. When choosing persimmons, ensure the green calyx is in place and the fruit is brightly coloured, glossy and firm. They may have some minor blemishes, but this will not affect the quality of the fruit. While firm, persimmons are still very delicate, therefore ensure you handle them carefully to avoid bruising. 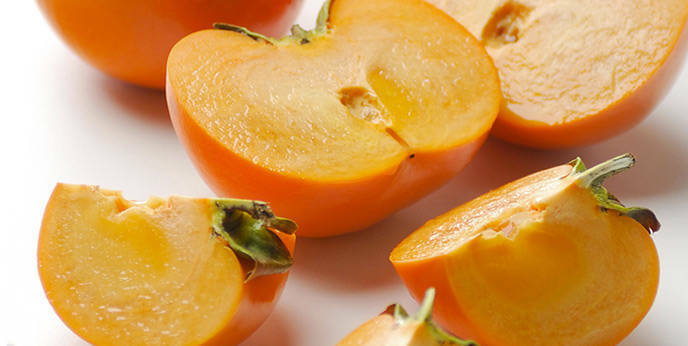 Nutritionally, persimmons rate better than many fruits. They are a great source of dietary fibre, contain high levels of vitamins A and C, potassium and beta carotene as well as some calcium, magnesium, phosphorus and iron. They are also fat free, making them a guilt-free pleasure you can enjoy as often as you like! While persimmons have only recently appeared on the Australian fruit market, there is nothing young about this blushing beauty. They have been grown in Southeast Asia for thousands of years, originally from China but also considered native to Japan, Korea, Burma and the Himalaya. They were introduced to Australia in 1977 and not grown commercially until 1982. Persimmons are perfectly suited to Australian conditions, preferring sub-tropical to mild climates. They are tolerant to heat but do not like extreme cold and are also drought resistant. They are grown commercially all over Australia, including southeast and subtropical Queensland, NSW, Shepparton, Mildura, the SA Riverlands as well as the Snowy Mountains and southwest WA. Available throughout their season in supermarkets and all good grocers, so grab a persimmon and prepare yourself for pure pleasure!